It's true. Your Guardian coverage can help pay for college. Included with your Guardian coverage is a college tuition benefit. As the cost of college continues to rise faster than inflation and medical costs,1 Guardian is helping families keep up by providing this benefit in arrangement with SAGE College Tuition Benefit. 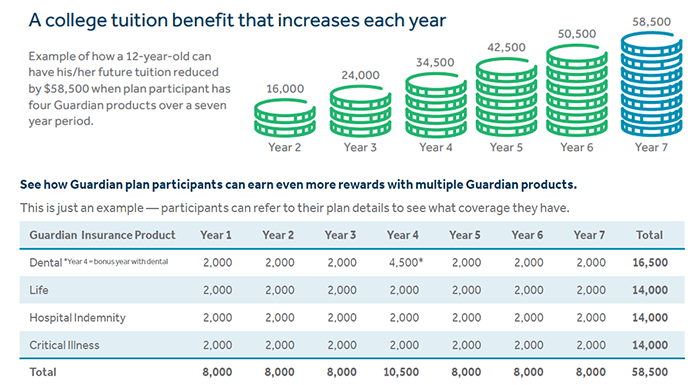 Members enrolled in a Guardian plan earn $2,000 in annual Tuition Rewards®. One Tuition Reward point = $1 in tuition reduction. Tuition Rewards can be used at over 375 institutions, with 80% ranked among "America's Best" by US News and World Report in 2016. Members can share the benefit with eligible relatives, including children, nieces, nephews, step-children and grandchildren, subject to certain restrictions. Colleges participate as a way to boost their student recruitment. Guardian Insurance is underwritten by The Guardian Life Insurance Company of America (Guardian), New York, NY or its subsidiaries. 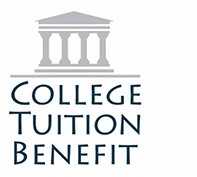 The Tuition Rewards program is provided by The College Tuition Benefit®. Guardian does not provide any services related to this program. The College Tuition Benefit® is not a subsidiary or an affiliate of Guardian. The College Tuition Benefit® is not an insurance benefit and may not be available in all states.